Gadget: Hi! You're drooling fanboys, what's my name? Oops, sorry, got that backwards. Gadget: Golly, I didn't know that my hand smelled THAT good. Gadget: Golly, uh... it's really sweet of you guys to serenade me and everything, but to be honest I'd have preferred real musical instruments over those weird squooshy noises you're making with your paws. Gadget: And next on the DIY channel, how to make two chipmunks speechless. 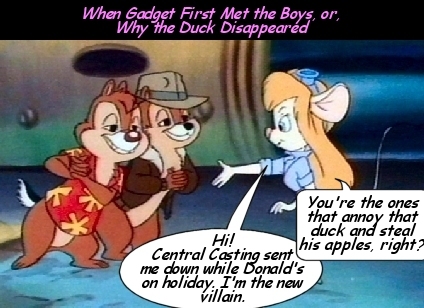 Gadget: Actually, I'm a cyborg just like governor Arnie, watch! Ehm, one of you happen to have a swiss army knife or anything else that's sharp? Gadget: Golly, guys, I would like to thank you all for putting up a very special surprise party for me. That outstanding 100th Caption party was a blast! Gadget: You are getting sleepy...sleepy......You will now become under my power at the count of three...1-2--- (oh wow...two slaves coming up)...........3!! Gadget: For America's Funniest Home Videos: This week I've asked these two lovestruck chipmunks for an ultrasonic bipolar coupler - so let's see what they've brought me! pupspals - Hey, it only took her a hundred captions to get it! Gadget: That's how guys react to me?!? No wonder I have so many hits on my website! Gadget: Golly, you are the 1st two people that have gott'en thru my Salesmen traps alive,congrads!!! Gadget: They can't resist, animal magnetism works.